Hampton gain a well deserved, and much needed, point after holding runaway leaders Woking at The Beveree. On a day bathed in beautiful sunshine, 1069 fans turned out to see The Beavers take on The Cards. It was comfortably the biggest home crowd of the season, the previous best being the 629 that braved the cold on Boxing Day for the defeat to Staines Town. The crowd for this game would have been split roughly 50-50 between home and away fans, with the travelling Woking supporters confident of turning over Hampton and registering another three points on their path to the Conference. However, despite being pummelled by Eastleigh the previous week, Beavers’ fans were also rather hopeful after the club signed two new permanent players in Neil Jenkins and Joel Ledgister, while also bringing in Welsh Under 21 midfielder Reece Jones on loan from AFC Wimbledon. The Woking team seemed to struggle to get to grips with the Beveree pitch, and Hampton looked dangerous every time they attacked. The reunited strike force of Tarpey and Ledgister looked like it was immediately clicking back into gear, with the strikers linking up well several times to cause the Woking defence problems. In fact, Woking almost scored own goals on two or three occasions in the first half, but goalkeeper Aaron Howe somehow kept the scoreline blank. Jenkins, making his league debut for the club, went close with a header, and for the first half hour or so, Hampton had the edge in attack, if not in possession. Woking did look dangerous, especially down their right, but the Hampton defence stood firm, although the visitors did hit the side netting on a couple of occasions. On 35 minutes, Beavers boss Mark Harper made a change, with Darren Powell being replaced by Dean Inman, and the young centre back was superb yet again, making several important blocks and challenges to repel the Woking attack. Wayne Gray did get a good header in on goal, however it was straight at Craig Ross, and in the last couple of minutes of the half, Hampton struck. Tarpey and Ledgister again combined well, with Ledgister feeding Tarpey, whose shot was well saved by Howe, and the loose ball was put behind for a corner. From the set piece, the ball was flicked on by the impressive Inman, and midfielder Josh Huggins looped his header back across goal into the far corner to give the home side the lead. It was only Huggins’ second goal of the season, and it gave the relegation strugglers a half time lead. The second half kicked off with Woking in search of the equaliser. Kieran Murtagh hit a fierce volley which was superbly cleared off the line by Inman, while at the other end Dave Tarpey had an effort blocked after a poor defensive header gifted him the ball on the edge of the box. Woking did level things after 65 minutes, the unmarked Paris Cowan-Hall scuffing home his shot at the far post. Woking then had a couple of good chances to take the lead, but first Cowan-Hall shot straight at Craig Ross, and then Moses Ademola shot wide when clean through. With 15 minutes to go, Dean Inman almost gave Hampton the lead, meeting a free kick from Jenkins with a looping header which was saved by Howe. It would have been a deserved goal for Inman, and for his team, but it wasn’t to be. 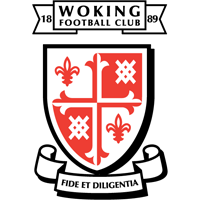 Woking went down to ten men with fifteen minutes to go, when Jack King was rightly sent off for a nasty tackle on Lewis Ferrell. Hampton couldn’t make the man advantage count, though, and in fact it was Woking who could have won the match late on. In the four minutes of time added on, Inman made a crucial intervention to deny Mo Shariff, and Ross then saved brilliantly from Sogbanmu’s header. That was the last action of the game, and the match ended 1-1. While on paper this was a good result for Hampton, a ninth draw of the season is not ideal, although they are only four points away from 19th placed Eastbourne Borough. They need wins quickly though if they are to stay up, and considering they have only notched five wins out of the first 28 games this season, they will need to match that from the last fourteen games to have a chance of avoiding the drop. Next up is a very tricky trip to fourth placed Chelmsford City on Saturday, March 3rd. Hampton & Richmond Borough: Ross, Ferrell(c), Jenkins, Jeffreys, Powell (Inman 36), Huggins, James (Alabi 90), Jones, Tarpey, Ledgister, Johnson. Subs not used: Moone, Andrews, Simmonds. Posted on February 26, 2012, in UTL Archive and tagged Craig Ross, Dave Tarpey, Dean Inman, Hampton & Richmond Borough, Joel Ledgister, Mark Harper, Vanarama NL South. Bookmark the permalink. Leave a comment.